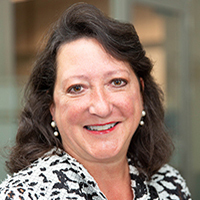 Marsha Millonig, MBA, BSPharm, a practicing pharmacist who works with both independent and chain pharmacies, has been selected as the 2018 Lawrence C. and Delores M. Weaver Medal recipient. The award is given annually to someone who supports the college and its students through service to education, the profession, research and the community. She will receive the award at an event to be held this spring. "It is such a humbling honor to be chosen to receive the Weaver Medal," Millonig said. "Larry and Dee Weaver were and are, respectively, colleagues, mentors, and friends since I began studying pharmacy in 1979. They provided steadying hands during my entire career in both Minnesota and Washington D.C. To receive recognition in their honor is so meaningful. More so is my selection by former recipients who represent such an esteemed group of colleagues of which I am so honored to become part of and I will continue to aspire to earn their respect." Millonig is a longtime supporter of the college and its students. She has been an active member of the Century Mortar Club and a Leadership Networking Partner. In 2003 she helped establish the college's National Board of Advisors and has served as its chair since its inception. She also is an associate fellow of the Center for Leading Healthcare Change. Millonig is the President/CEO of Catalyst Enterprises, LLC, a health care consulting firm that specializes in projects that allow pharmacy, distribution and manufacturing clients to be more efficient and value-added providers toward improved health outcomes. She also serves as the interim executive director of the Minnesota Pharmacists Association. Prior to forming her company, she was with the Healthcare Distribution Management Association (HDMA) and headed the philanthropic HDMA Healthcare Foundation. She also was with the National Association of Chain Drug Stores.